1.5V USB Powered: It is powered through 5V USB cable so that so that it even can be used with battery power banks or USB adapter, more secure, more convenient. 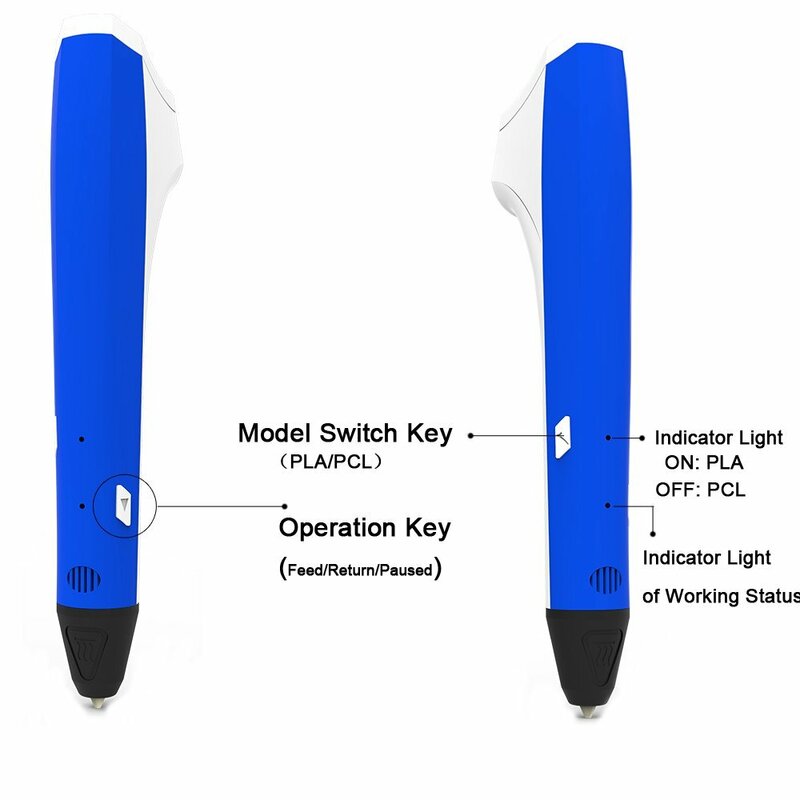 2.PLA/PCL FILAMENT- This 3D printing pen is capable of using 1.75mm PLA and PCL filament. 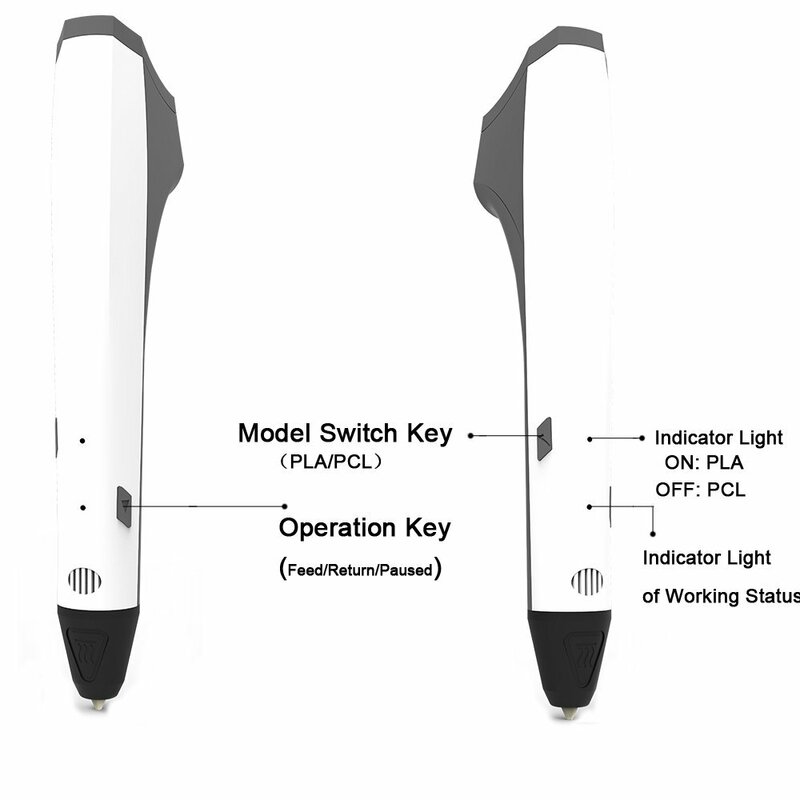 3.Safety: The 3D printer pen use patented ceramic nib that can dissipate heat better. Low temperature melting, no toxic, no clog. 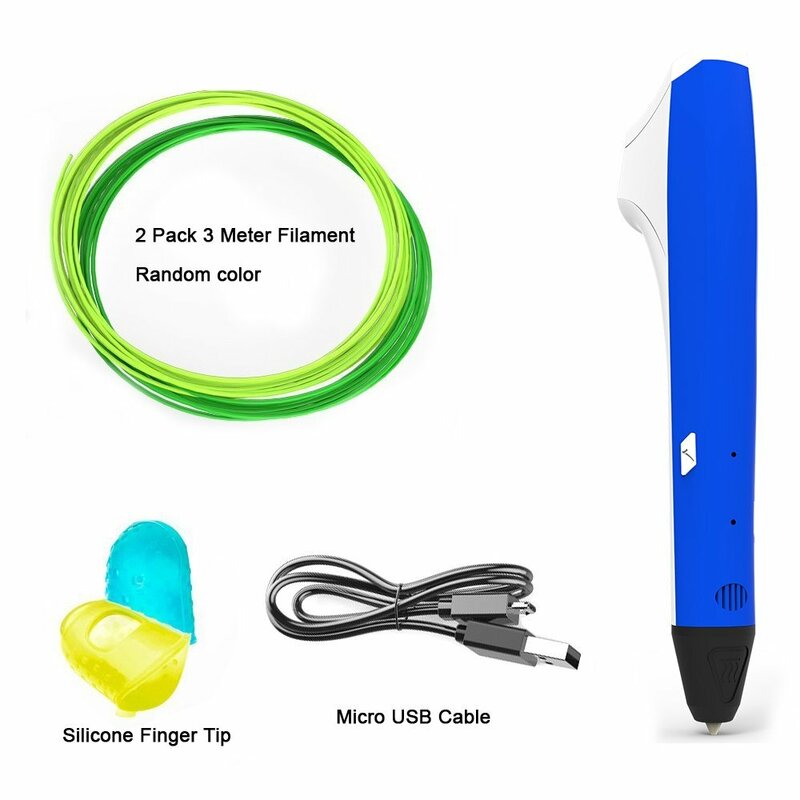 4.EASY TO USE, ONE BUTTON TO CONTROL: Ergonomically designed 3D drawing pen is easiest to handle, and simplest to operate. one button to switch filament model, one button to feed filament, return filament and Paused. 5.Please do not worry, if you have any problems,please feel free to find us. We are glad to serve with you and we will try our best to meet your needs. 1.Do not use this product near bathtub, wash-hand basin in the bathroom, or other place easy to touch water, otherwise it may cause the electric shock to result in death! 2.This pen tip after heating maybe so hot that cause burns, please do not touch pen tip or other part near it. 3.This product is suitable for 5 years or older children and adults. Children should use this product under adults supervision. 4.This product is not water-proof, also not breaking-proof. 5.Please use the original filament. It might cause damaged to the product if choose non-original filament. 6.In order to ensure continuous use, it is recommended to stop for a moment and cut off power supply after 1 hour continuous using, then back to use. 7. To avoid clogging the filament feeder inside, please cut the ending tip portion of the filament where you stop, because the melted part need to be cut off. Paypal allows you to pay via credit card, debit cards and electronics check(Paypal eCheck). We will leave a positive feedback to you after your payment is cleared. Please find us to cancel your orders if you are not able to clear your payment within 20 days. We will hold the items for you for 20 days. We ship within 1 working day after receive your payment. Please ensure that your address is correct before making payment, we are not responsible for any wrong address. Items will be shipped by USPS, UPS, FedEX, ONTRAC,or other Express Service depending on your location and item. Delivery time is about 2-7 days to most of United States, 7-12 days to Alaska, Hawaii, Puerto Rico. We are not responsible for import tax and custom duty. 30 days money back guarantee. If you are not satisfied with the items you receive, please return it in original packing within 30 days for replacement or money back. Please find us before return it. For non-defective items, buyer should pay shipping fee to us for an exchange or a refund. With guaranteed product quality, all our items are tested by our professional QC department before packing and delivery to clients. If you are not satisfied for any reason, please feel free to via eBay message to find us for solution, we will do our best to make sure you have a positive experience. We will reply your message within one business day. We are glad to serve with you and we will try our best to meet your needs. Specifications: Product size:159(L)x24(W)x 247(H) mm Weight: 45g Extra power input DC ±0.25V 2A Power input: 10W Adapter input 100-240v 50/60HZ (Adapter is not included) Consumable filament material: PLA/PCL（1.75±0.02mm） Filament Material Length: 3m Heating temperature: PCL (50-60℃) PLA (160-180 ℃) Package included: 3D Printing Pen x 1 USB Cable x 1 Operation instruction booklet x 1 Pack of PCL 3 Meter Filament x 2 Finger sets x 2 Description： 1.5V USB Powered 2.PLA/PCL FILAMENT 3.Safety: The 3D printer pen use patented ceramic nib that can dissipate heat better. Low temperature melting, no toxic, no clog. 4.EASY TO USE, ONE BUTTON TO CONTROL 5.Please do not worry, if you have any problems,please feel free to find us.